Listings sort files in collapsible tree format. Add files under parent headings, or even parent files. Files can be listed more than once. There is no limit to Listing's structure. 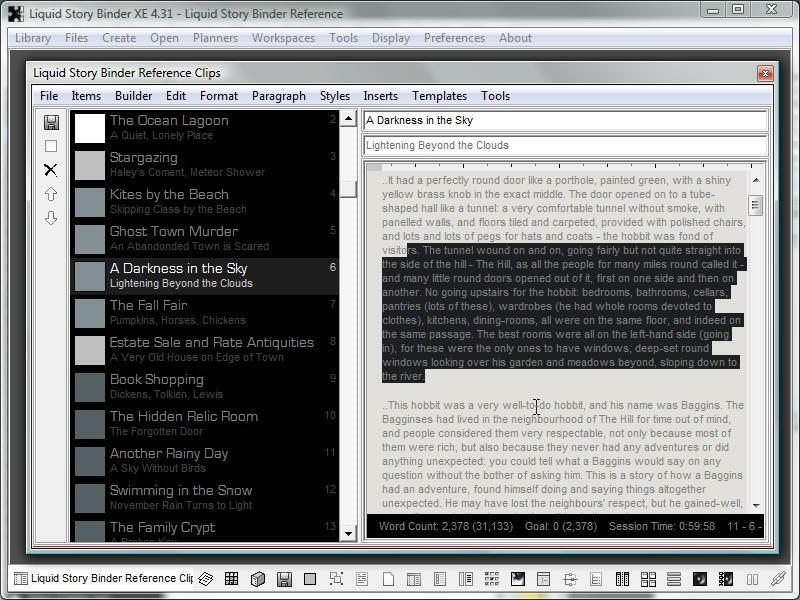 Press the ENTER key to add headers and line captions. 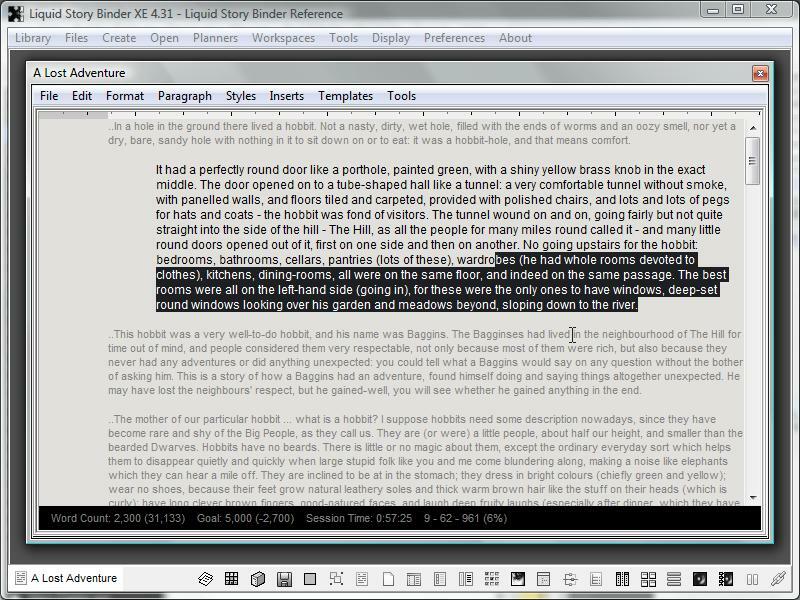 Chapters are the backbone of Liquid Story Binder -- the text and sentences that make up the pages of your manuscript. 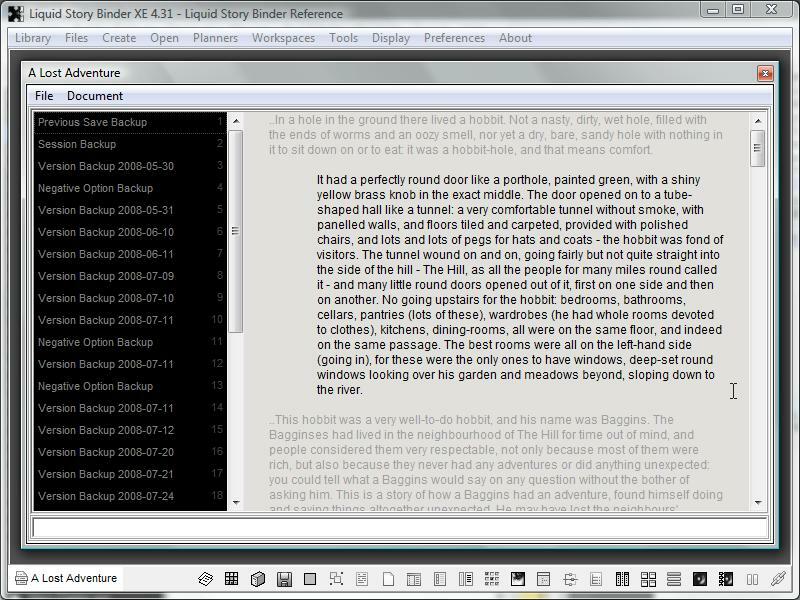 Chapters are saved in Rich Text Format. 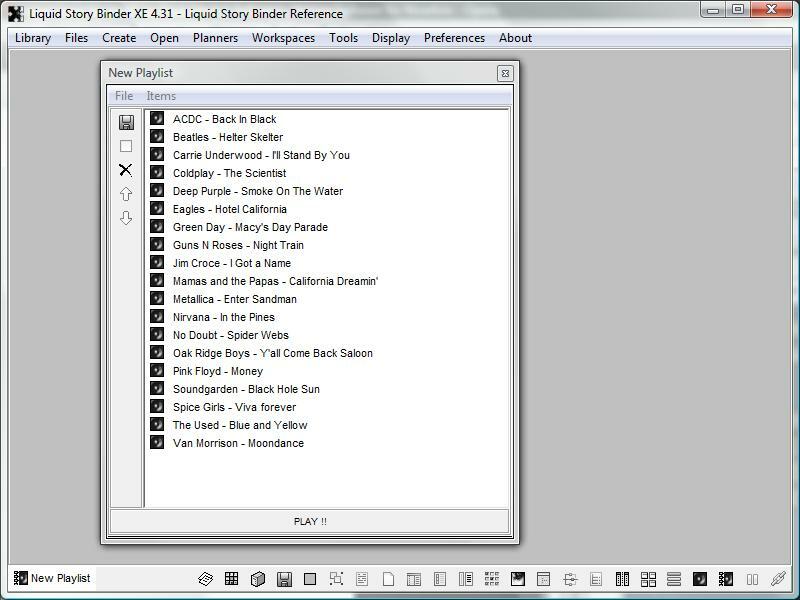 Use a Note window to save your chapter reference notes. To save a Note, simply right-click and choose 'Save'. 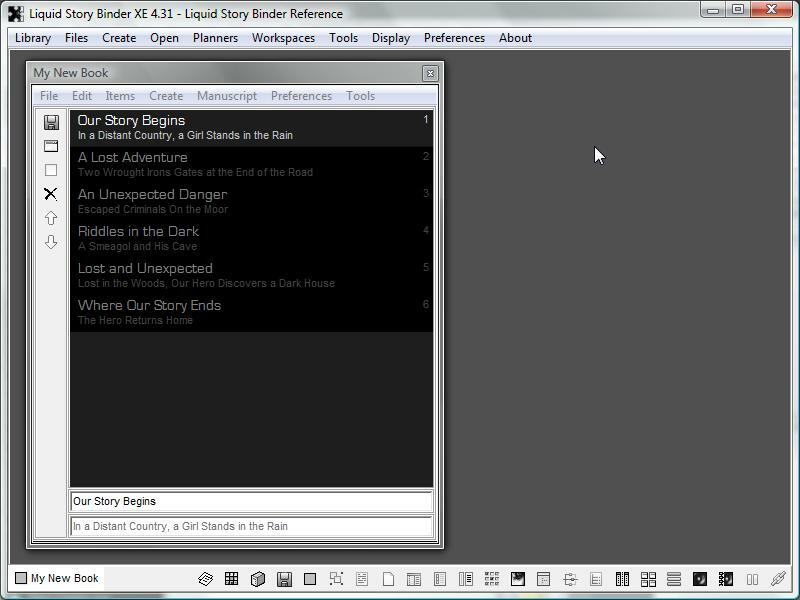 For every Chapter file, Liquid Story Binder XE creates a Backup file. In many ways, this Backup file resembles a Builder. 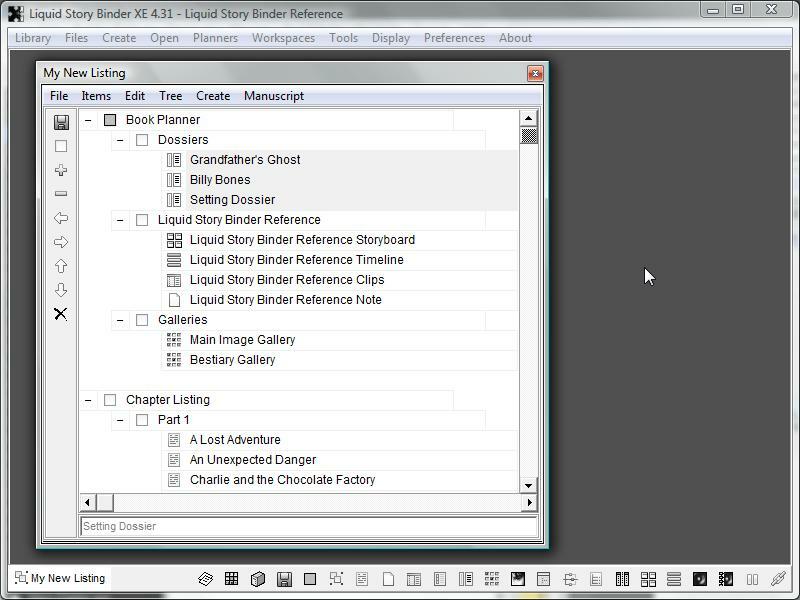 Entries, exact copies of the Chapter, are created, given a title, and added to the Backup. An entry is created for each version or daily change. Listed at the top of the Backup listing are entries for a 'Session Backup' and 'Previous Save Backup'. A session entry is created, just prior to saving, each time XE is closed and then re-opened. An entry is also created every time you say 'No' to saving. This entry is entitled a 'Negative Option Backup'. Quickly create a to do list using a Checklist. Use the two edit boxes below the main Checklist display to edit item titles and descriptions. Press then ENTER key to add new items. Simply double-click any item to check it off. Dossiers organize people, places and things. Use title adjectives with descriptions and a portrait. 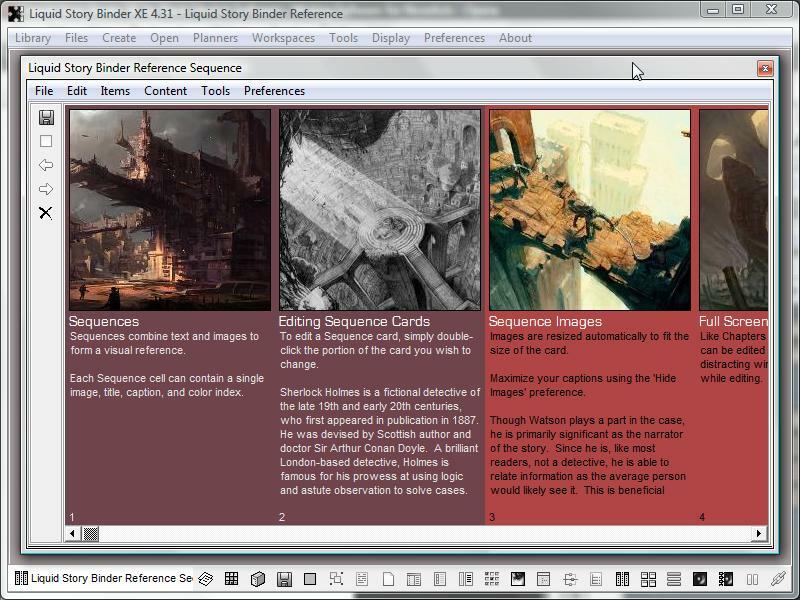 You may add an unlimited number of reference images to help with your writing experience. 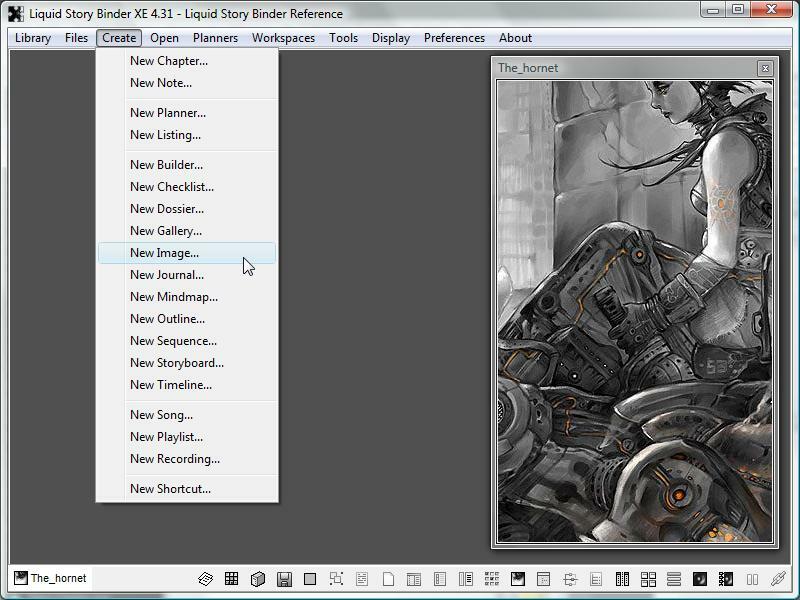 To add a new image, simply click 'New Image...' from the 'Create' menu. 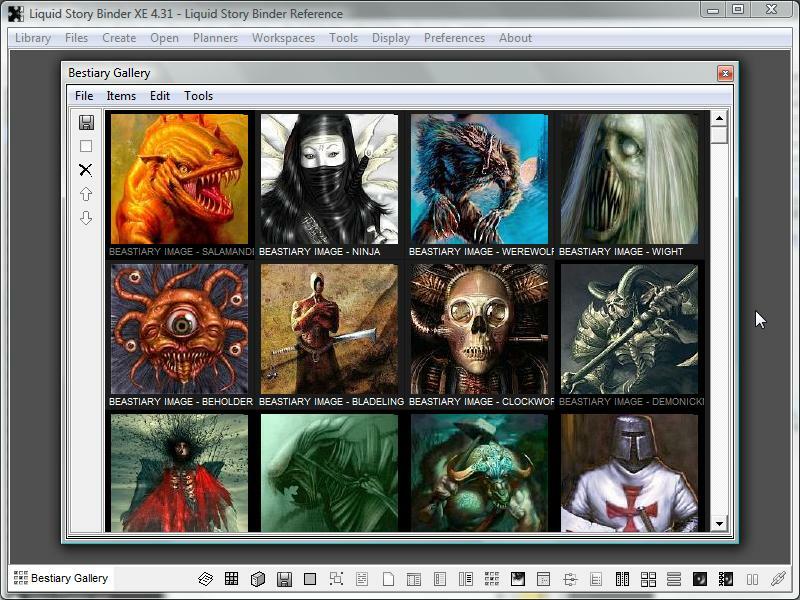 Select an appropriate image file, and it will be copied to your book directory, allowing you instant access to it whenever you work. 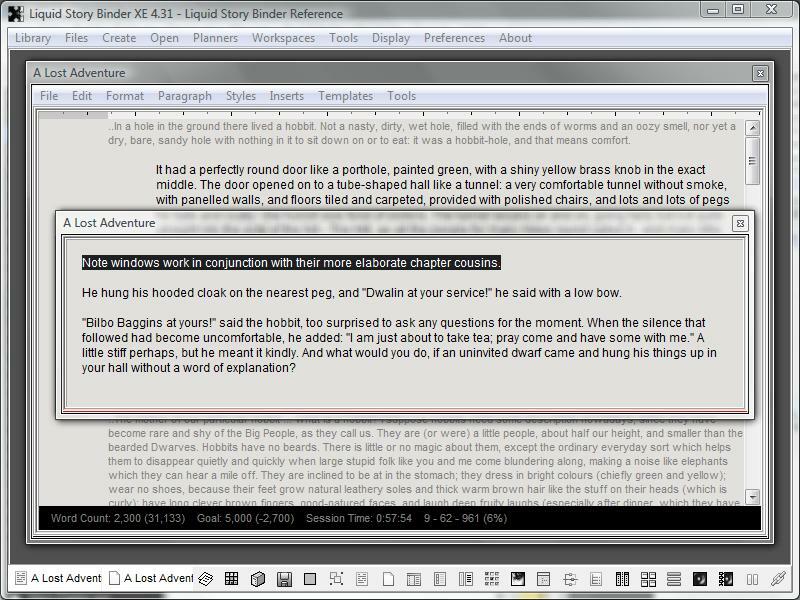 Create a writing journal, or a journal for each one of your characters. 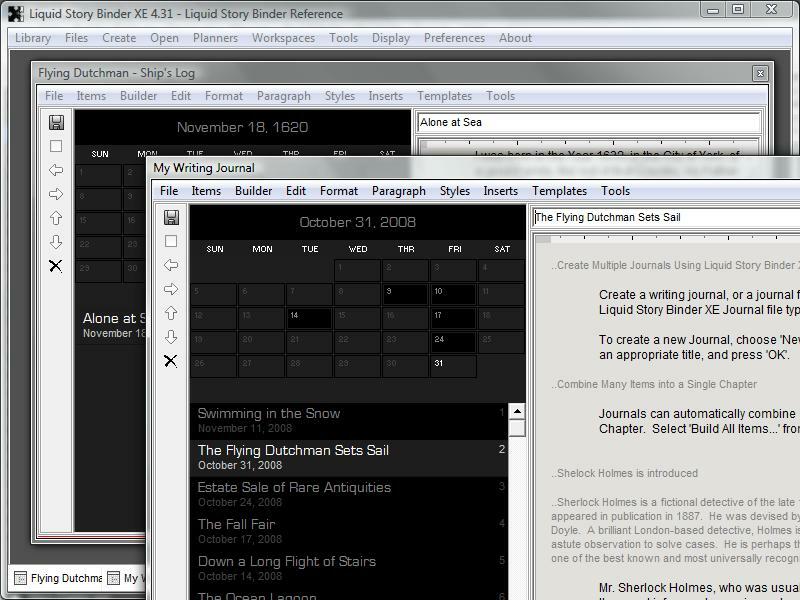 Use the Liquid Story Binder XE Journal file type to write historical novels, day by day. 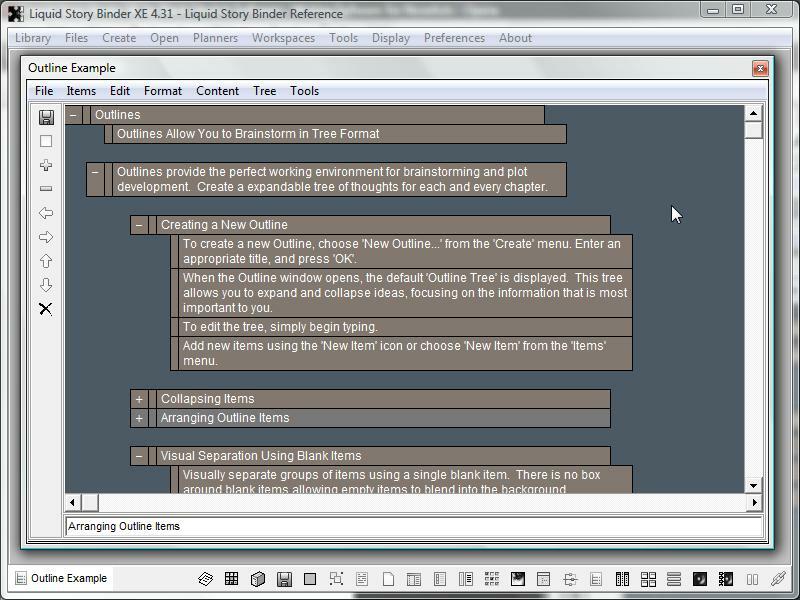 Outlines provide the perfect working environment for brainstorming and plot development. Create a expandable tree of thoughts for each and every chapter. A list of horizontal columns with titles, descriptions and images. Use a Sequence to organize a series of events. 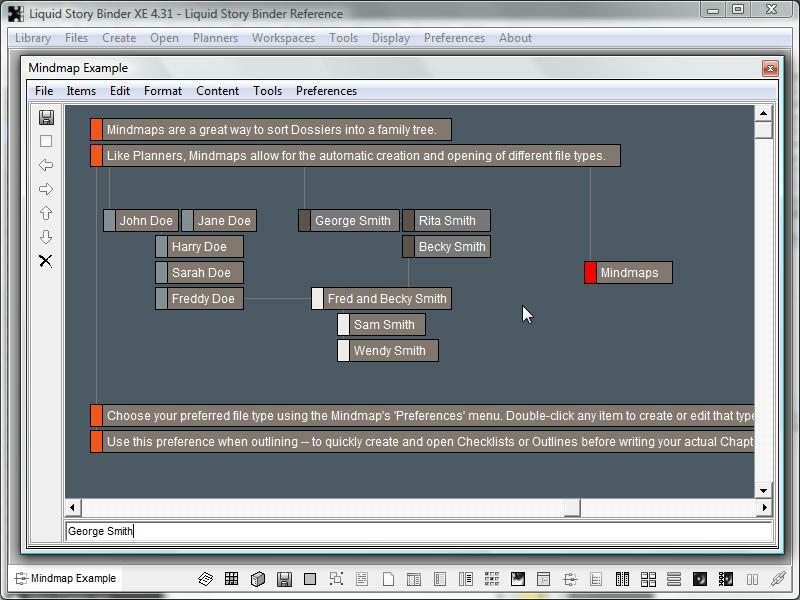 Use Sequences to create and open documents. 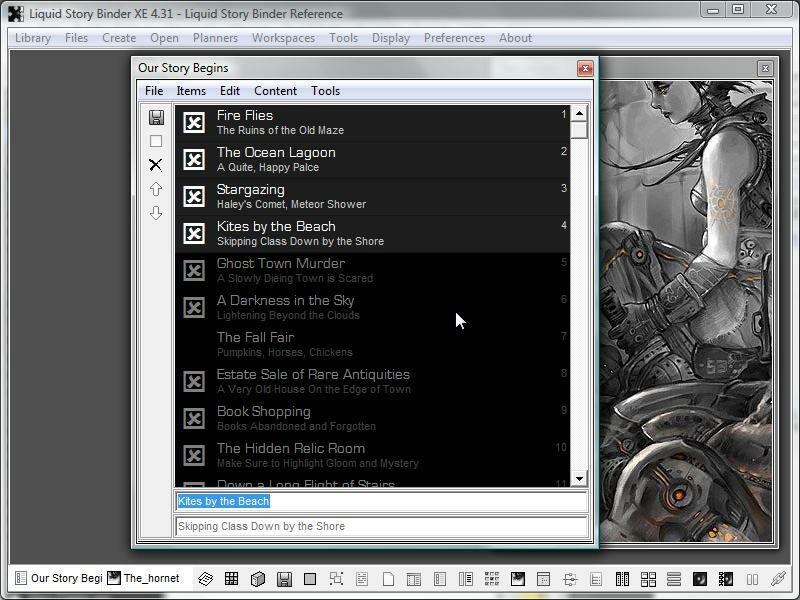 Storyboards combine text and images to form a visual reference. 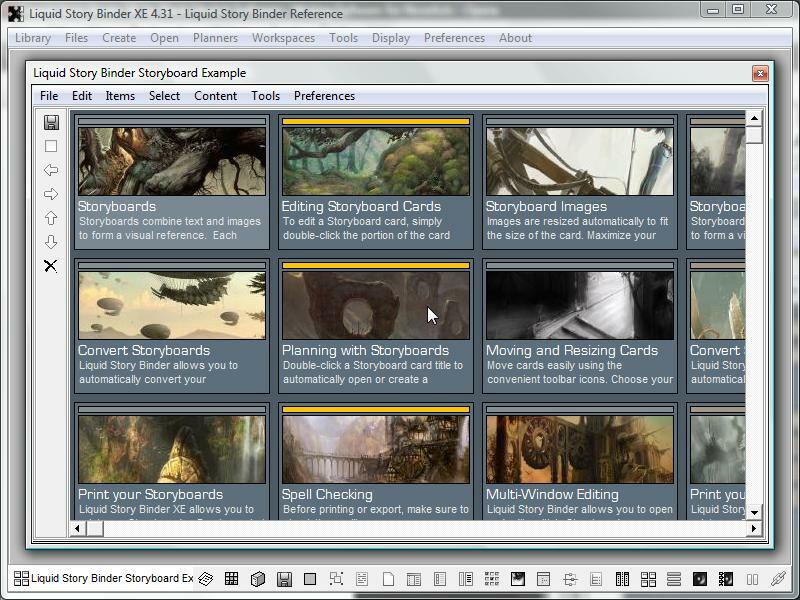 Use Storyboards to create and open documents. 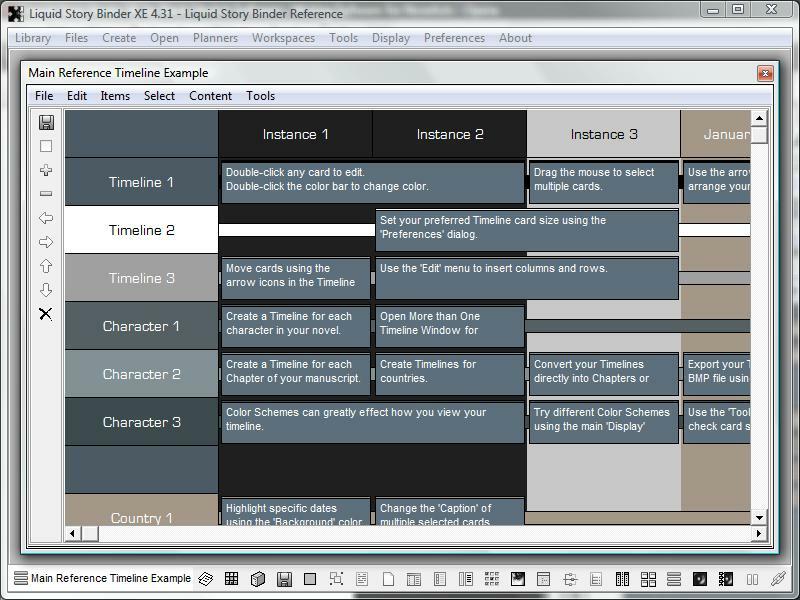 Liquid Story Binder allows you to quickly arrange ideas along multiple colored timelines, using individual text-based cards. Sort your songs into playlists for quick listening. Access them from the main menu.